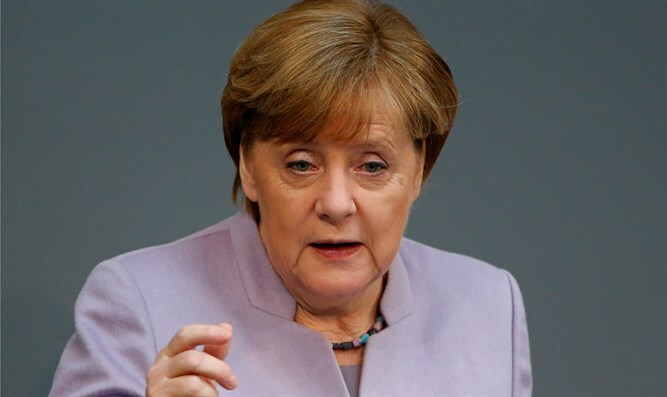 German Chancellor backs her Foreign Minister's meetings with leftist groups during his trip to Israel. German Chancellor Angela Merkel on Friday backed her Foreign Minister Sigmar Gabriel’s meetings with leftist groups during his trip to Israel, which prompted Prime Minister Binyamin Netanyahu to cancel a meeting with Gabriel. Asked if Gabriel had her backing, Merkel told the RND newspaper group, according to Reuters, "Yes, he has that. We were in close contact during his visit to Israel." Netanyahu cancelled his meeting with Gabriel after the minister met members of the anti-IDF organizations Breaking the Silence and B’Tselem a day after Holocaust Remembrance Day. Merkel told RND she often meets civil society groups during her foreign travels, adding the dispute "changes nothing in our conviction that support for the state of Israel is part of our raison d'etat." The Chancellor said earlier this week that it was "regrettable" that Netanyahu cancelled the meeting with Gabriel, with her spokesman noting that talks with non-governmental organizations were common during foreign travel and should not set off a rift between allies. Earlier on Friday, Netanyahu criticized Gabriel in an interview with the Bild newspaper, saying his decision to meet with representatives of the leftist organizations was “tactless”. "I find it extremely tactless for such a meeting to take place at this time," said Netanyahu. "On this day we mourn the murdered members of our people and our fallen soldiers." Netanyahu said the logic behind his decision to cancel the meeting with Gabriel was straightforward. Despite denials by Gabriel, Netanyahu insisted he did in fact attempt to call Gabriel to explain the cancellation, but was turned down by the Foreign Minister. "I wanted to call on Foreign Minister Gabriel to explain my point of view and to clean up the matter, but he declined the telephone call." Responding to Netanyahu’s comments, Gabriel said on Friday, according to Reuters, "It seems Mr. Netanyahu is under big pressure over what he has done. This is why he is appearing in German newspapers."